I can remember when Palm Sunday first began to mean something to me. It was in the late nineties, and I was in my mid-twenties. I grew up in the church, so by then I would have celebrated fifteen to twenty Palm Sundays, and I had undoubtedly enjoyed walking in processions and waving palms, but Palm Sunday hadn’t struck me as important. For one thing, it was the last Sunday before Easter, and so it seemed insignificant in comparison. But one Palm Sunday the Reverend Professor Doug Fullerton, now seven years’ dead, preached a sermon that changed everything for me. When I knew him Doug was in his eighties; he died the day before his ninetieth birthday. 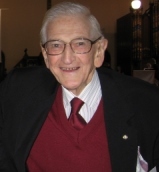 Doug was born in 1918; was ordained in 1945; served as a Methodist Missionary in Fiji for twenty-one years; completed a PhD in the United States in the late 1960s; was appointed the Principal of Queen’s College at Melbourne University in 1973; and became the Professor of Christian Ethics in 1976. When I met him he was retired, and a Minister in Association in the Church of All Nations in Carlton. I’m telling you about Doug partly because he was a wonderful man who should be remembered widely, but particularly because Doug was a protester. He believed that part of his vocation as a minister was to campaign for social justice, even if that meant taking to the streets. It was Doug who advised me to buy a clerical shirt when I was ordained, so I could wear it on protest marches. And it was Doug who first pointed out to me that Jesus’ entrance into Jerusalem is an acted parable, an act of political street theatre, and that Jesus was a street protester, too. Doug encouraged us to leave the church and take to the streets, and on Palm Sundays we did. This morning, before our ecumenical procession, we heard about Jesus’ entrance into Jerusalem from the gospel according to Mark. That gospel is probably the earliest; definitely the shortest; and arguably the strangest and scariest of the four gospels; and the story it tells of Jesus’ entrance into Jerusalem is also strange and scary. Mark’s version is not the overwhelming celebration that the church has created by combining the Palm Sunday stories of all four gospels. For one thing, there’s no mention of palms. Mark does not have Jesus acclaimed as king; the crowds quote psalm 118: “Blessed is the one who comes in the name of the Lord”, but they then go on to say: “Blessed is the coming kingdom of our ancestor David.” There is definitely the suggestion that Jesus will be the one to restore this kingdom, but not the clear acclamation of Jesus as king that the other gospels tell us about. In Mark’s story, the procession only accompanies Jesus to the entrance of the city; Mark describes Jesus entering Jerusalem quietly: “Then he entered Jerusalem and went into the temple; and when he had looked around at everything, as it was already late, he went out to Bethany with the twelve.” Matthew and Luke have Jesus immediately cleansing the Temple in the middle of a noisy crowd, but Mark tells us that the cleansing of the Temple waited for another day. Mark gives us a quieter, more subdued, entrance than Matthew or Luke, but one that is just as much a protest against the status quo. In Mark’s version, all through the ride to Jerusalem Jesus is silent. He doesn’t respond to the cries of the crowds, to their cloak and branches-throwing. He is silent in the Temple, looking but not yet acting to drive out those buying and selling. The crowd might think that they are taking part in a triumph; Jesus knows that what is really happening is a funeral procession. Today the church celebrates both Palm Sunday and Passion Sunday, which is why Bill and I read the passion narrative as the gospel reading. We are reminded that Jesus’ triumphant entrance cannot be separated from his coming death. At the time the crowds didn’t know that; but Jesus did. No matter which gospel we listen to, we see in Jesus’ entrance into Jerusalem a piece of political street theatre. Jesus and his followers act out a parody of a Roman imperial procession with its chariots and soldiers and war horses. In this triumph the central figure rides silently on an unbroken colt; the message of his entry is that something new is coming; not the continued rule of Rome or the restoration of the Davidic kingdom, but new life. The crowds cheer; the powers that be, both Roman and Temple, worry. Ultimately, the powers that be conspire to kill Jesus. This is what the powerful do when they feel threatened; either symbolically or literally they kill the threat. In Jerusalem two thousand years ago the threat was Jesus, whose entry into Jerusalem told people that there was a different way to be, beyond the choices offered by the contemporary Roman and Jewish leaders. On the day that we remember as Palm Sunday Jesus took that message to the streets. Two thousand years’ later, we are called to follow him in taking the same message of a different way to the streets. That is what I remember Doug Fullerton telling us at the Church of All Nations more than fifteen years ago. Jesus took his call for a different way to the streets, and so Palm Sunday is a particularly suitable day for Christians to follow in his footsteps and challenge the status quo in the cause of peace, justice and the kingdom of God. I have a photo of the members of the Church of All Nations, Carlton, marching together at a rally on Palm Sunday. 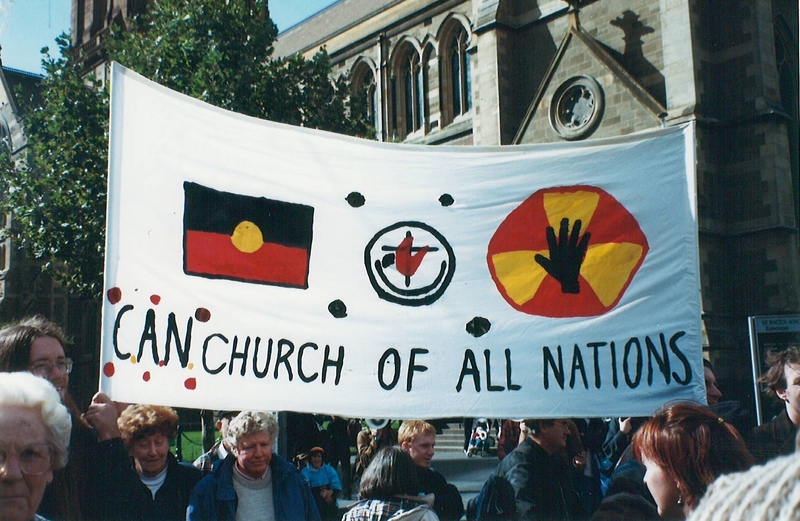 We have a hand-painted banner with a very drunk-looking Uniting Church logo between the Aboriginal flag and a radiation symbol. I suspect that we were marching for peace and against nuclear weapons. 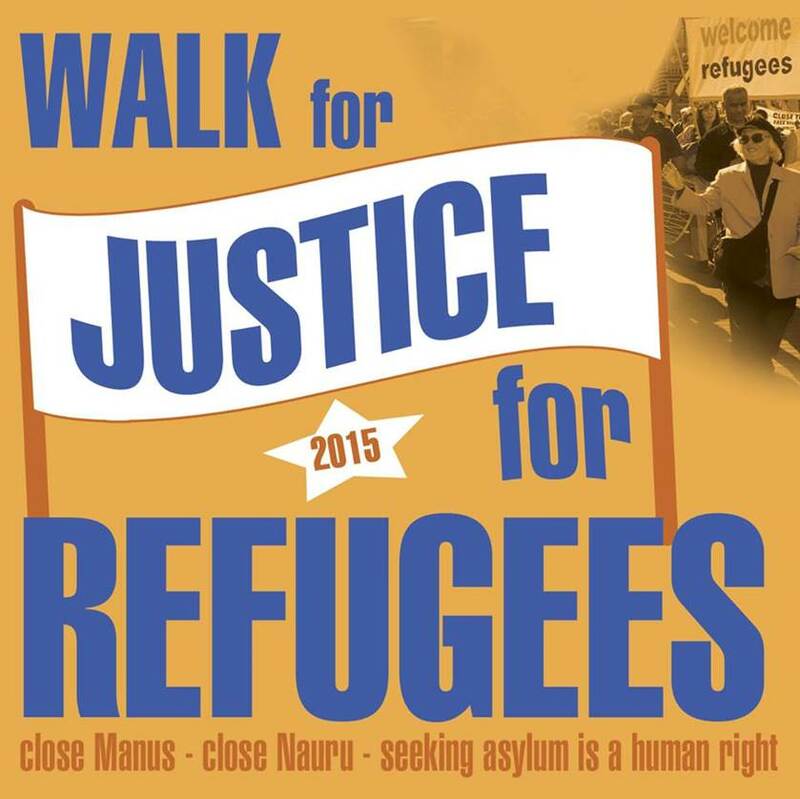 Today, members of the Anglican and Uniting churches will gather with people from all denominations and all parts of civil society, to march in support of refugees and against the current treatment of asylum seekers. I have no need to tell any member of either of our churches why it is important that we stand up for the rights of asylum seekers and refugees. (And I have to say that as a minister in the Uniting Church I am very envious of the huge “Let’s fully welcome refugees” banner on St Paul’s Cathedral.) We know that welcoming the stranger is one of the core values of our faith. Palm Sunday reminds us that sometimes that standing up for the least of our brothers and sisters means taking our faith to the streets. One of the things we celebrate at Easter is the ultimate victory of justice and peace over hatred and violence. But we only get to Easter by walking with Jesus step by step on his journey to the Cross, recognising all the violence that human beings can inflict on each other. Today, Palm Sunday, is an excellent day to commit ourselves again to working towards God’s just and peaceable reign. The rally this afternoon is one of the ways we can do that. There are many others. But in everything we do, let’s try our best to live as citizens of God’s new kingdom, acknowledging Christ alone as the one we follow. Amen. This entry was posted in Political Activism, Sermons and tagged asylum seekers, Mark 11:1-11, Palm Sunday, refugees, Year of Mark. Bookmark the permalink.